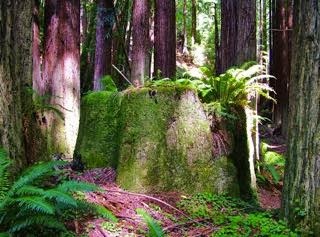 THPBlog: Mendocino Redwood Company to log on steep and unstable slopes near the Navarro River. Mendocino Redwood Company to log on steep and unstable slopes near the Navarro River. This THP is about 6 miles NW of Navarro, CA and Highway 128 at an elevation of 40 to 1,000 feet. The THP area flows into the Navarro River which is listed as impaired for sediment and temperature and contains coho salmon and steelhead. Mendocino Redwood Company is planning a tractor and cable logging operation on steep and unstable slopes in redwood, Douglas fir and grand fir forests. There are 5 road failure sites including multiple cutbank sloughs across roads, and perched material below an existing skid trail. Mendocino Redwood Company wants to use a skid trail with unstable soils above, and a road built upon side cast between 2 skid trails. Landslide terrain exists throughout the THP area including debris slides, debris side slopes, rockslides, and disrupted ground. MRC also wants to use ground based equipment on slopes over 50% grade that do not flatten before reaching a watercourse, and on existing skid trails with steep slopes over 65% grade, and on slopes over 50% grade with a high erosion hazard. 19 road drainage sites are planned for work including rocking, dip construction and culvert repair/replacement. There is potential marbled murrelet habitat adjacent to unit 2. For spotted owl site MD053; the THP will reduce nesting/roosting habitat by 73 acres within .7 mi, for spotted owl site MD486; the THP will reduce nesting/roosting habitat by 13 acres within .7 mi, and for spotted owl site MD442; the THP will reduce nesting/roosting habitat by 21 acres within .7 mi. This THP is a few miles south of Mendocino Redwood Company’s Tom Bell Complex THP 1-14-114 MEN. More information is available on the THP Tracking Center website.